As Donald Trump and congressional Republicans take steps to roll back Obama-era financial regulations, the public remains divided over whether regulations of financial institutions have gone too far or not gone far enough. Overall, about half of Americans (49%) say “the government has not gone far enough in regulating financial institutions and markets, leaving the country at risk of another financial crisis,” while 42% say the government has gone too far, “making it harder for the economy to grow.” These views are largely unchanged over the past several years. By roughly two-to-one, Republicans and Republican-leaning independents are more likely to say financial regulations have gone too far (63%) than to say they have not gone far enough (31%). The balance of opinion among Democrats and Democratic leaners is reversed: More than twice as many Democrats say the government has not gone far enough in this area (62%) as say it has gone too far (29%). 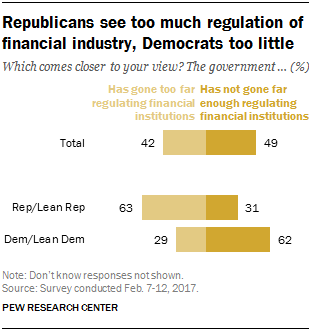 The partisan gap over financial regulation has changed little since Pew Research Center first asked the question in September 2013. There also are differences in views of financial regulations by age and education. Among Americans younger than 30, just 33% say the government has gone too far in regulating financial institutions, while more (52%) say it has not gone far enough. Older Americans are more divided in their views. Majorities of those with at least a four-year college degree say the government hasn’t gone far enough regulating financial institutions: 56% say this, while just 34% say regulation has gone too far. By comparison, a smaller share of those with no more than a high school diploma (41%) think there has not been enough regulation of the financial sector, while 51% say the government has gone too far regulating these institutions.